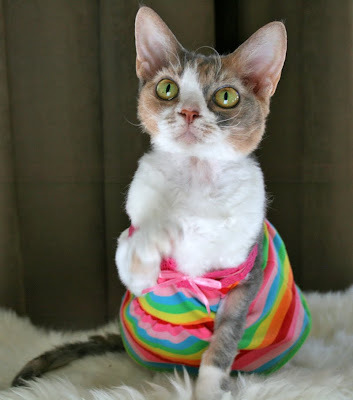 Daisy the Curly Cat: I Am Wearing a Rainbow! I Am Wearing a Rainbow! Look! My Mommeh rigged up a new modeling stand for me! And here I am showing off my colorful rainbow dress. Well, I am not sure if it is a dress or a shirt. I think I will call it a jumper. See the pretty ribbon and crochet part at the top? That is my favorite part. Even though my jumper has many colors, the accent color is pink. On account of pink goes with every color. Wearing a rainbow makes me feel happy. Would you like to hold my paw? That is a VERY colorful dress, Daisy! And you are right, pink does go with everything! Miss Rainbow Daisy, you look very pretty today. Does your mom have new lighting at your modeling place too? I just love that dress/shirt/jumper, Daisy! I'd get one for myself but I doubt I could ever look as cute as you! We'd love to hold your paw, Daisy! You look so summery happy! You look so appealing in that last photo, Daisy! Of course we would hold your hand. You wear your rainbow well, Daisy! I would like to hold your paw Daisy! I hold my paw out to you. Seeing you in rainbow colours makes me happy :) thank you. Daisy, you look resplendent in your rainbow jumper. Daisy you certainly are modeling well these days. Those are gorgeous pictures.We certainly do want to hold our paw. That is very nice of you to offer it to us. I love when your photos show off your curly eyebrows and whiskers, Daisy. Such a great model you are! every bit as purrty as you are! Daisy, that is a beautiful jumper! And how cool that you have your own modeling stand now. You look beautiful in your rainbow. I agree that pink makes the outfit. You are an awesome model, very professional. Have a great weekend sweetie. Beautiful as usual, Miss Daisy. You look fabulous in every color! Can you imagine if you were wearing a DOUBLE RAINBOW?!? You look stunning in that rainbow jumper. We have the same question as Poppy - is your Mom using special lighting or did she find a new space with natural lighting? Those photos are pawsome. You rainbow jumper is furry beautiful and you wear it well, sisfur! Mom says she would like to hold your paw, your head, your body, well, ALL of you! Definitely want to hod your paw...looking good there, Daisy! very impressive modeling place. it brings out the rainbow in you. Does your mom say "lights, camera action" when she's ready to start your fashion show? We think that dress/sweater is very cute and we know Skeezix will love the colour - did you buy it with him in mind. You look very pretty in your rainbow jumper. Awwwwwww!! What a beautiful rainbow dress Daisy? It looks wonderful on you! And yes we would lvve to hold your paw!! Daisy, you are a superb model and we think that jumper is lovely. The colours are purrfect! Aw, Daisy, you look stunning in your striped jumper! Perfect choice for a Friday! That is a very luffly jumper, Daisy. what a beautiful jumper daisy! it is "you"!!! OMC OMC OMC THOZE ARE BYOOTIFUL COLORS DAISY AND SEEING THEM ALL TOGETHER AT ONCE KINDA MAKES MY EYES GET ALL BLINKY AND MAKES ME FEEL KINDA KRAZY!!!!!!!!! WOOD YOO LIKE TO JOIN MY HARUM, CUZ BOY YOO LOOK HOT JUST WARING A SHERT WITH NO UNDERPANTS. Daisy, I think you look MAH-VELOUS! That wee pink bow I see is especially fetchingk. I'll hold your paw anytime Daisy, specially when you are such a colourful girl ! You look great in your jumper Daisy! I love your rainbow jumper! I used to have something quite similar when I was a little girl! :) Rainbows always look happy to me! Yes, I WOULD like to hold your paw! Daisy, you look absolutely beautiful. 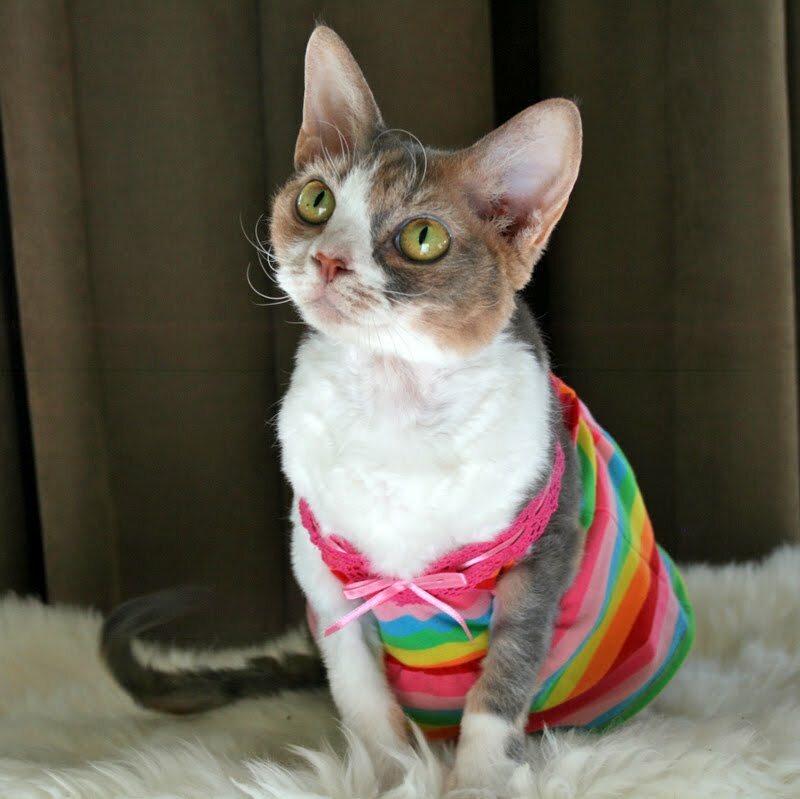 This photo session proves that you look good in EVERY color of the rainbow! Okay, Daisy, this has got to stop. Why do you let your Humans torment you so? Next thing you know they'll be having you wearing a sombrero while they happily click away with their cameras. Be careful... you'll wind up on YouTube in some weird getup yet... maybe even playing the piano or eating spaghetti. Watch your back, Daisy. They're coming and won't stop until they make you ADORABLE! Oh, I surely fear for you. Take care precious girl! An we like your new modeling stand! The jumper is adorable...hmm, crochet huh? I like to crochet...I wonder if I could crochet cat clothes? daisy, your rainbow is so pretty. and it is so true, pink goes with every color. and yes, i would love to hold paws with you!! we could sit on the sofa and chat while holding paws. Daisy! Maybe it is a mod mini dress! Your Rainbow jumper is adorable, Daisy! Are you available for personal shopper services? We've told you before, our Mommy is a terrible dresser and we think you would smarten up her look...if you can get her out of T-shirts and Jeans, that is. your rainbow jumper is really pritty Daisy. I bet you can run very fast in it too! You make that rainbow jumper even brighter Daisy!!! I think that jumper rocks! You look ready for the weekend! Daisy, that is a very beautiful rainbow jumper! You are so stylish, I would love to hold your paw. Whatever you call it it sure is purrty just like you Miss Daisy. Rainbows make us feel happy so we can only imagine how happy wearing a rainbow dress makes you feel. What a beautiful rainbow, Daisy. You're gorgeous as always. Dat is sooo lovely...hold yoor paw? Um, can we hug yoo instead? That is a very pretty rainbow jumper Daisy! We like your new modeling set too - it's very dreamy! Your rainbow jumper is pawesome! Daisy, our Mummy would love to hold your paw!! We would come right over and dance a rainbow dance with you, if we could. It is a very pretty outfit!!! Oh Daisy, that is such a pretty outfit. Daisy, I think you are the best model ever! Oh Daisy!!! You iz da catsez pajamuz! We woold lovez to hold yoor paw & so woold da momee. She wants to (warnin') kissy you!!! Pess: Delilah sez tanks so much fur your purrz. Did your mom make that dress? My favorite too, the pretty ribbon and crochet part at the top. Well, in simpler words, it means it's gotten even more fierce! I'm too impressed! Have you been taking acting classes?.... because I swear you're showing more depth of emotion in your expressions, girl! Looks like you guys got a whole new set up with professional lighting and everything! Fabulous! Daisy, you and your jumper have brought me much joy!!! I heard with indication to this site from my buddy. He pointed me here and told me I’d find what I need. First thanks to my pal then to you for having those informative articles for visitors. 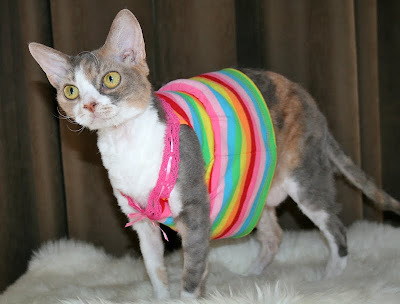 The rainbow jumper is lovely against your furs! I would love to hold your cute little paw! Daisy, mommy said she read yours and Harley's blog while she was gone, on her iPod. I had to stay here with a baby sitter! The idea, me, a senior girl! She loved seeing the fashions and you look gorgeous, as always. You should always wear bright colors like your rainbow jumper. Oh, and please tell Harley that his edjakayshunal blogs are just right for us kitties to learn about ourselves. Illustrayshuns too! Mommy said now I can blog and catch up with you since she is here to assist me. What a busy girl you are. Awww Daisy you're looking so pretty. Mr Jingles is purring for you! You look so beautiful in your rainbow jumper, Daisy!! Thanks so much for stopping by and wishing me a Happy Gotcha Day! Rainbow colors definitely suit you, Daisy! We love the rainbow outwear~! That is very lady look and very fresh!! Daisy, you look beautiful in your cute jumper. That is SO bootiful! Ya look just so pretty wearin it..
Daisy, yoo look awesome ~ just like a real rainbow! I absolutely adore Daisy, I have a dog named Daisy and she has been known to wear a pink wig! Your rainbow jumper is so cute and I really enjoy visiting your blog. Oh Daisy!That pink really brings out your pink nose! I would love to hold your Paw. Your rainbow dress is so pretty. It is one of my favorites. You are truly a beautiful model.